This abstract was created by order of the commander of the Second Military District in accord with 14 U.S. Stats. 429, 15 U.S. Stats.2, and 15 U.S. Stats. 14, which gave him ultimate responsibility for the registration of voters and the conduct of elections. 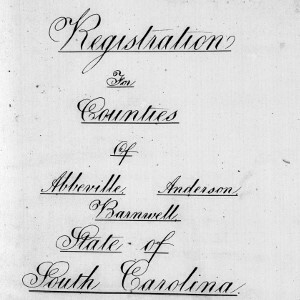 The series was abstracted prior to 12 September 1868 from the series Voter Registrations Reported to the Military Government and was deposited with the Secretary of State in October 1868. The series records the name and race of each registered voter, arranged first alphabetically by county, second by registration precinct, and thereunder alphabetically by polling precinct. Within the polling precinct the names appear alphabetically by first letter of surname, with whites and blacks grouped separately. The series was microfilmed by the South Carolina Department of Archives and History (4.00 microfilm reels) in 1987, the microfilm was scanned by the University of South Carolina Digital Collections and the South Carolina State Library created the metadata for the South Carolina Digital Library in 2014. There is currently no complete index, although Richland Library has created an index for Richland County (http://localhistory.richlandlibrary.com/cdm/ref/collection/p16817coll12/id/631) Thanks to the transcribing efforts of volunteers at Richland Library many counties’ hand-written entries are now full text searchable. Additional transcriptions will continue to be added until the entire collection is fully searchable.